DEVELOPING INTERPERSONAL SKILLS FOR EFFECTIVENESS. Developing interpersonal skills makes for proactive habits that help to nurture relationships. Good interpersonal skills work as tools that enable you to secure the cooperation of others and achieve a meaningful end. On a different note, poor interpersonal skills rear up as a lack of approachability and poor listening skills. Also, a Judgemental or arrogant bearing, impatience to get on with the agenda, being excessively work oriented or intense, being too raw and direct, at inappropriate times, and not taking the time to build rapport with others, give evidence for poor interpersonal skills. By developing interpersonal skills through the strategies outlined below, we buckle up to effectiveness in our personal and official capacities. Focus on others first. To suspend your personal reactions and to focus on others first, stabilise you to get along with all manner of people. This gesture brings about an ease of transaction that enables you to get what you want without damaging or alienating the other party. The benign interpersonal climate fostered by your goodwill gesture prompts your interactants to look forward to another interaction with you. Accepting others’ usual modes of doing things, not resisting their style, and neither defending your own nor letting style become an issue in performance, bolsters the ease of interaction. See the differences in people and use them for the benefit of everyone. What people do first, what they emphasize in their speech, what they focus upon like taking action, details, concepts, feelings, other people, reveal telltale signs of differences. The diverse values cherished by people also differentiate them. Read your audience and center your interpersonal approach on the other person’s perspective. Being vigilant to the clues of the emotional state of your audience helps you to detect when they are uncomfortable with you. The question whether being uncomfortable means backing up, stumbling over words, cringing, standing at the door hoping not to get invited in, resolves itself when you pay attention to your audience. Being arrogant, insensitive, distant, too busy to pay attention, too quick to get into the agenda, too dismissive of others, rise as factors that make people uncomfortable with you. The curriculum of developing interpersonal skills works to discourage offering answers, solutions, conclusions, early in the transaction. To assume those attitudes compromises the ease of transaction. For effectiveness, pay attention to the needs and perspectives of others first, and then respond in a manner that takes them into account. Developing interpersonal skills makes a good case for being open and approachable within the first three minutes of an interaction. Since the tone of an interaction and first impressions are formed within the first three minutes, putting others at ease and making them comfortable, within the initial minutes of an interaction turns out crucial. When people are comfortable and at ease, they find it convenient to disclose needed information. To make yourself approachable, you have to initiate rapport, listen, share, understand and comfort the other party. Approachable people secure to themselves the benefit of getting more information, knowing things earlier and getting others to do more things. Getting others to initiate and disclose early in a transaction encourages them to reveal their position and point of view. This insight from the revelations helps you to respond for good. Thus, developing interpersonal skills renders importantly the unique perspectives of others. To continue with, developing interpersonal skills paves way for the worthy habit of listening without interrupting. Listening to understand, to take in information and to respond appropriately, form the background of traits that characterise people with sound interpersonal skills. Such people avoid instant judgement but listen without interrupting and then ask clarifying questions. Taking notes helps one forward in this regard. Nodding and paraphrasing the meaning of others’ communication signals understanding. For one to get in adequate data implies that he or she postures as a good listener. For good, developing interpersonal skills promotes a mindset that sees to the sharing of relevant information without holding back. In return for this, one gets in more data from others. Developing interpersonal skills portions out as being open about your thinking, on a personal or business issue, and inviting response from others, passing on tidbits of information that broadens the perspective of others and helps them to discharge their responsibilities better. Although certain information appear unnecessary for others to discharge their tasks properly, the practice of developing interpersonal skills tolerates the revelation of such information to others since they find it motivating and confirming of their values. Endeavour to know at least three personal things about the people you interact or work with. Converse with them about their interests or affairs relating to their children or spouse. Thus, to establish common grounds and connections not only involves discussing issues of strategy, global events or market shifts, but it also includes conversing about personal matters within appropriate boundaries. Delight in smiling, sounding open, relaxed and calm. To confirm the value of others by keeping consistent eye contact, nodding while the other person talks, speaking in a paced and pleasant tone, advocates for the good of developing interpersonal skills. Glancing at your watch, fiddling with paperwork or giving abrupt glances, to signal disinterest feature as habits that deserve avoiding. Speaking too rapidly or forcefully, using strongly worded language or going into unnecessary detail, do the disruptive. Replicate around those that you are uncomfortable with, the interpersonal habits that make you effective. To be savvy with direct reports and tense around senior management and to be comfortable with people of particular gender, race or background often marks the experience of many. Developing interpersonal skills sanctions replicating in a difficult setting, the interpersonal habits that work and make one savvy. Engage in behavioural experiments to dispute and disprove your fear of meeting strangers and of what others might say. For you to prove that the bad, scary things you think might happen if you initiate contact with strangers, are exaggerated, take to the good counsel of talking to strangers outside the familiar home or office environment. Embracing the goal of meeting new people at every social gathering also accomplishes a similar effect. Observe the effective behaviour of confident people and then practise those behaviours. Look for the common interests you share with people that get you uncomfortable. To do that creates a platform for improving the quality of the relationship. Also, looking for the strengths that others sense in them and acknowledging the traits, work to uplift the relationship. Putting your judgements on hold, nodding, asking questions and summarising, to confirm the value of another, root for the good of developing interpersonal skills. 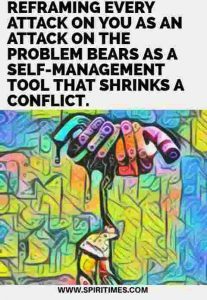 To neither apologise nor criticise and to respond neutrally in contentious situations by restating the problem that needs solving, accounts for developing interpersonal skills. Remember that reacting and hitting back only draws in rebuke. Separate the person from the problem. In a situation where the other party holds on to spew forth venom and anger, the benefits of developing interpersonal skills can still come to you if you ask clarifying and open-ended questions instead of reacting directly. Helpful open-ended questions include: “why is this particularly upsetting to you,” is there anything I can do to help.” To avoid judgements and to restate the other person’s position from time to time, helps you to separate the person from the problem. Reframing every attack on you as an attack on the problem, serves as a self-management mechanism. The approach helps one to remain calm under pressure. Saying nothing and keeping your cool in response to unreasonable proposals, attacks or a non-answer to a question often gets the other party to concede some grounds and reveal his or her true interest. To shrink a conflict, one must endeavour to show understanding. Demonstrating understanding and embracing a dual perspective promotes the cause of developing interpersonal skills. Most of the items are very true and easy to practice. I do follow most of these. This is an interesting and informative read. i try to be modest, but sometimes anger gets the best off me. I’ll try your way, and see, how it helps. I think I will your tips. Theses are really interesting and informative kind. Developing Interpersonal skills are really important. Very interesting and informative read. Would definitely try some of these tips myself. Thanks for sharing. This is such an informative post! Interpersonal skills are incredibly important. Sadly, this is something that many people lack! Wow. I like this post. I really need to develop Interpersonal skills and I learn some good tips from you. I believe if I can get this right, it will help me tremendously help with my work.